An alternate filling I plan on trying this year comes from my friend Susan B. (ME!!! whoohoo! ), who lived in New Orleans. She says this one is the closest to the traditional "plain king cake" filling. She uses 2 cups pecans that she puts in the food processor until they become a paste,1 stick of soft butter, 1 tbsp of cinnamon, 1 tsp allspice, 2-3 tsp vanilla and 1 tsp of butter flavoring, 1/2 c sugar. Process it all together and then spread it on the dough. Lightly sprinkle cinnamon over the dough before spreading the paste as your filling. 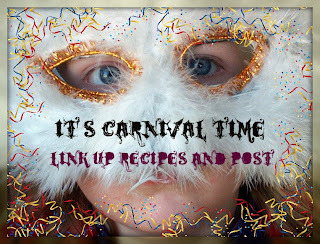 CLICK FOR MORE Carnival, New Orleans, Party food ideas! Eye glass purchases online. Time for a change? Career GPS Book Review- Is the assignment right? Stash Your Cash Scott Sweetstakes! Free Nabisco Cookies! Yummy Coupon of the Day!